My PC Vista Capable or Premium ready? – Modern processor (at least 800MHz). – 512 MB of system memory. – Graphics processor that is DirectX 9 capable. – 1 GHz 32-bit (x86) or 64-bit (x64) processor. – 1 GB of system memory. – Support for DirectX 9 graphics with a WDDM driver. – 128 MB of graphics memory (minimum) Pixel Shader 2.0 and 32 bits per pixel. – 40 GB of hard drive capacity with 15 GB free space. Well, the operating system may be same, but the way you see them will be different. One word that explain all is AERO. The new aero user interface is very visual, complete with features such as glass-like interface elements, translucent Start Menu and taskbar, Windows Flip 3D, and Live Taskbar Thumbnails. 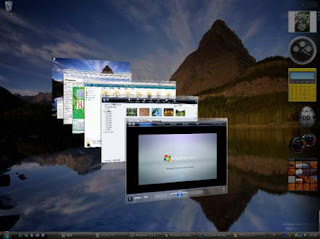 In the earlier versions of windows the user interface was rendered in software. In Vista with Aero, it utilizes the hardware capabilities of your graphics card. Its not in entirety that systems with on-board graphics will be unable to run Aero, rather these systems will run very slowly, may be unstable and hence would reduce the overall productivity. In fact onboard graphic chips like Nvidia 6150 for AMD processors and Intels latest X3000 for the 965 chipset are Windows Vista Premium capable.